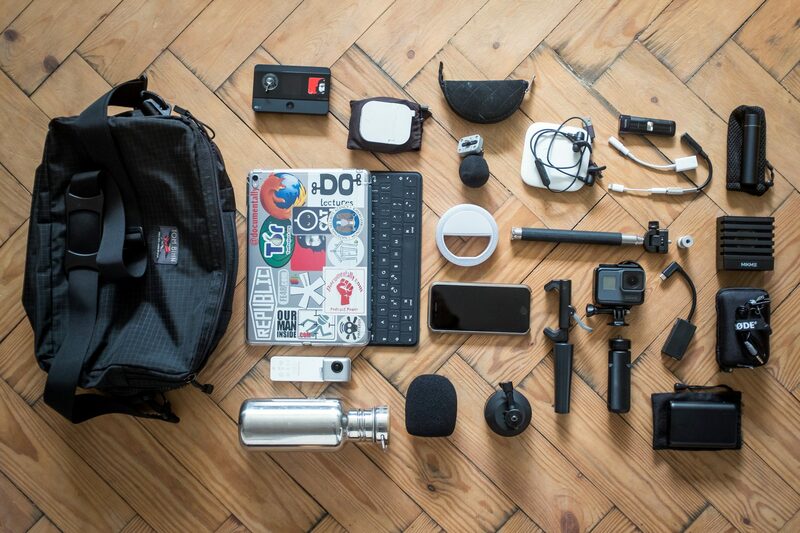 Next time I get asked what kind of gear I use to capture stories, I shall link to this page. For a few weeks at least. …and many other things with a bunch of apps that you might suggest in the comments. This is my small bag set up. I have a few combinations depending on assignment. I work with what’s in my pockets on most days. I also have a backpack option. My main tool is still the iPhone so many of the accessories pictured above are designed to work with the iPhone7. Much of the gear will also work with Android devices but you had best check compatibility before you splash out. The massively expensive iPhone updates will soon be here but I can see myself using this set up for a little while yet. I have used some Amazon affiliate links in the list below and endeavour to link to the cheapest or best solution. If you have found a better or cheaper option than the one I have listed please let me know in the comments below. The bag I carry every day might stay the same, but the gear within tends to slowly evolve. I mostly use the top pack off the Tom Bihn Hero’s Journey. It’s an amazing bit of kit that I wish they sold separately. It goes from cavernous shoulder bag that gives easy access to tech, but also converts to a compact daypack for moving fast or climbing trees. If I didn’t have this I’d go back to the Tom Bihn Co-Pilot. If I need to carry a laptop or heavier gear I wear the Osprey Escapist backpack. It’s lightweight and covered with handy pockets. Some of the items pictured above may be obvious but i’ll list them roughly from left to right. TP-Link Mifi – Great for a back up wireless connection and foreign data SIMs. I have a small suction hook fashioned to it so I can hang it from windows. Mu usb charging plug – A UK wall plug that folds flat and delivers 2.4Amps via a single USB port. Bowers and Wilkins C5 – Wired headphones. I use these for monitoring and working on the iPad. 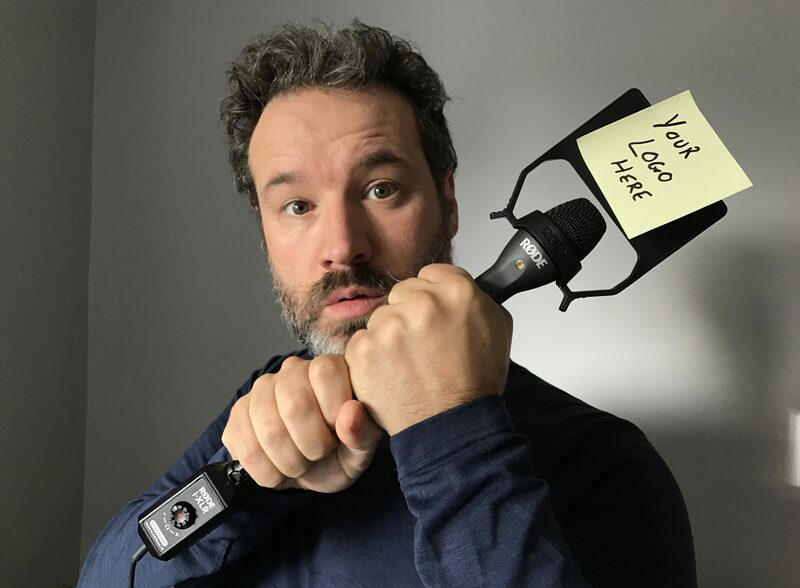 Shure MV88 – A great little stereo mic that goes into the lightning connector. If this isn’t in a bag it’s in my pocket. I use it every day. Aukey Bluetooth Headphones – For iPad use I have wired, but for mobile podcast listening and editing I use these bluetooth headphones. Amazing quality for 20 quid. USB Type C to USB3 cable – For charging and updating my GoPro Hero5. SanDisk Connect Wireless Flash USB Drive – This is what you need if you want to get audio, photos or video off a microSD card and onto a phone. Lightning to USB camera Adapter – Bloody expensive for what it is. Some unofficial copies work but not for long. Apple Lightning to 3.5mm headphone adapter – Unlicensed copies never work with a mic. This does. Anker Power Core+ Mini – A handy size for small power top-ups. Gives one full phone charge. iPad Pro – Mostly for writing, browsing and live tweeting. I rarely carry my laptop now. Logitech Keys-To-Go Bluetooth Keyboard – For typing fullscreen on the iPad. Has some handy shortcuts keys. 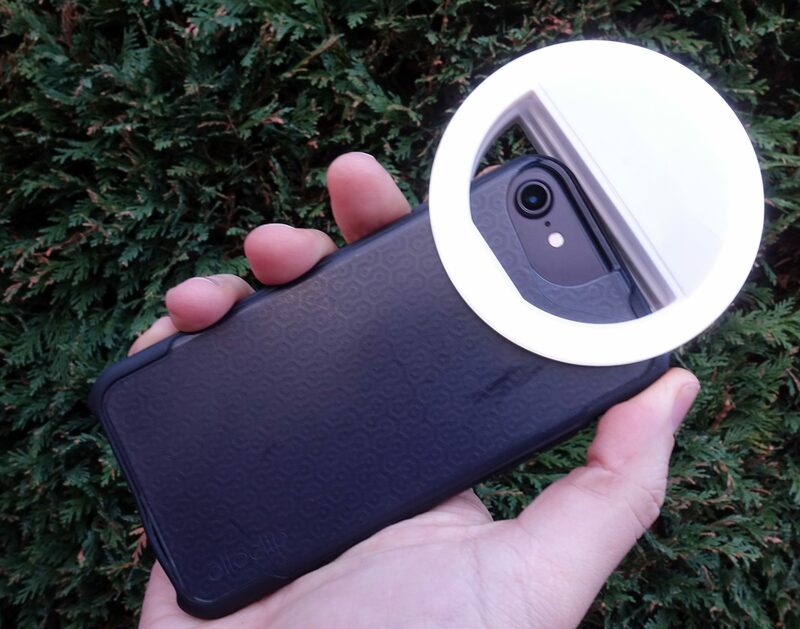 LED Selfie Light – Also works when videoing others and handy for adding a little fill light on contrasty days. Selfie Stick – Only really useful if you can also screw a small tripod into the bottom. Great for 360’s etc. Female to female quarter inch adapter – Handy for hacking tripod/monopod mounts together. iPhone7 – Dread to think how many hours this has done. Glif quick release phone mount – I use this with the handle that came with my Zoom H2. Expensive but decent bit of kit. GoPro Hero5 – Great for a second camera, to shoot underwater, or at speed. GoPro Protective case – Cheap and hackable. Glue a microphone mount on top. Garmin Verb tripod – Really nice but hard to find little handle/tripod. GoPro Hero5 mic adapter – Shop around and you might get this for £40. Still quite expensive. 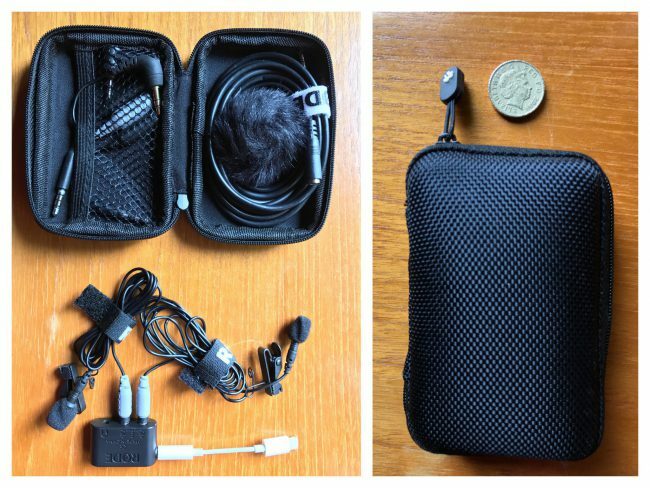 Two Rode SmartLav+’s with SC6 spitter – This is my 2-person interview recording system straight into the phone. Insta360 camera – Not only a lot of fun, great for immersive live streaming. Klean Kanteen – The water bottle I carry everywhere. It has saved me a load of cash and saved the sea from a little plastic. 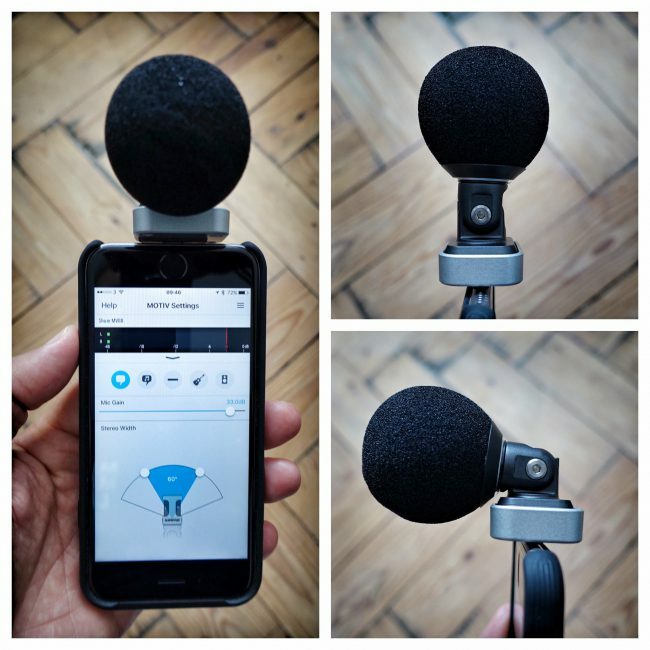 Mic shield – For slipping over the phone mic in light winds and to avoid plosives. 360 rotating tripod adapter – A handy tool for creating moving time-lapses. Anker Powercore 10000. Powerful mid range battery pack for charging on the go. That’s everything I’m likely to carry on a generic day of documenting. Of course I’m missing out some of the more specialist audio/visual gear I may not use on a day to day basis. I only share the equipment I use for covert recording in workshops. 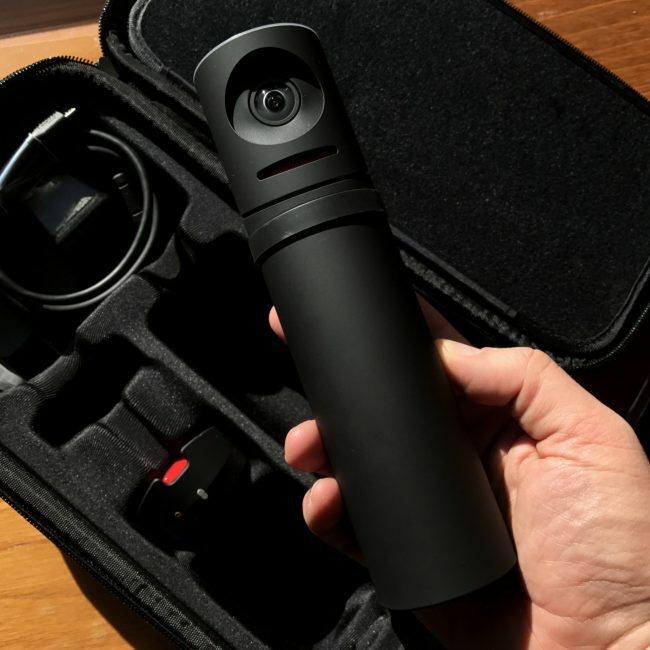 Same with some of the live streaming gear like the Mevo. Much of the above kit has been featured in my weekly newsletter which is far more eclectic than this blog but not archived online. I took the annoying ‘SUBSCRIBE NOW’ pop-up off this site in the hope you might subscribe here -> Documentally.com/newsletter. Let me know if you have alternative kit solutions for me to look at. Don’t forget that as well as using this kit to document out in the field (festivals, conferences or actual fields) I also offer hands on training on how to use this stuff and more. Hi! Regarding your review of the Rode Videomic Me. Im using it on a Samsung Galaxy S7 phone and I get static in the video sound. Any ideas? No idea i’m afraid. Have you asked rode on Twitter. They are very good at responding. Have you tried recording in airplane mode to see if it’s cellular interference? Just perusing this again, and your Amazon links have borked. Weird. They all worked for me.